Pay homage to your heritage's traditions by including Pae Baek package into your Ceremony. Pae Baek is a Korean wedding custom that is traditionally held on or a few days after the official Ceremony, with usually only family members present. The Ceremony begins with the older couple seated on cushions behind a table in front of a painted screen, with the newlyweds opposite them. The newlyweds perform a deep bow which begins standing and ends with the newlyweds pressing their foreheads to their hands while kneeling on the floor. 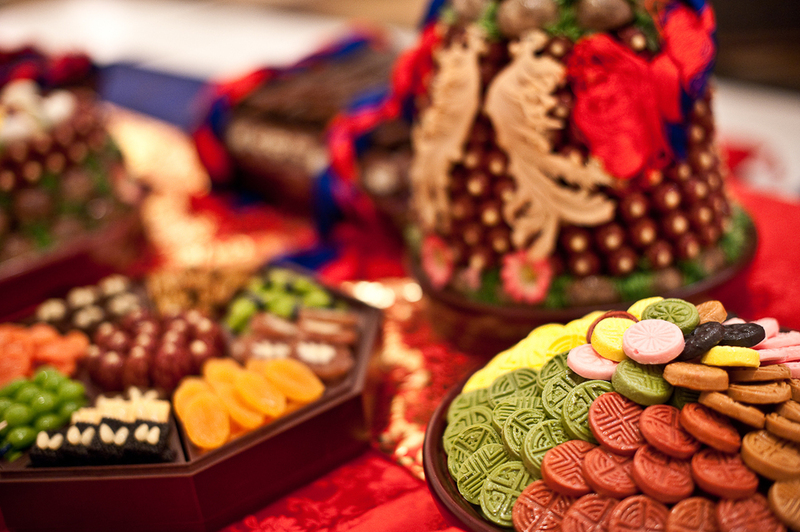 The bride may present the groom's parents with jujubes (Korean dates) and chestnuts, which symbolize children. A variation will have the newlyweds offering cups of wine, usually cheongju. The bride offers the cup to the father, and the groom offers the cup to the mother. Sometimes the parents will then also offer the newlyweds cups of cheongju or soju. The older couple then shares some wisdom on marriage from their advanced experience. Finally they will throw the jujubes and chestnuts back at the bride, who has to try catching them with her wedding skirt. In the United States, this ritual is held a few days before the ceremony. The bride may also receive gifts of money in white envelopes. Modern Korean weddings have incorporated the Pae Baek ceremony after the reception. The original Pae Baek was exclusively for the groom's side of the family to be introduced to the new family member, the bride. In current day Korean weddings, they have also allowed for the Pae Baek ceremony to be with the brides side of the family also.